Kevin Saunders Creative Services » NEW RECORD RELEASE! That was then… But a couple of years ago Takashi asked me to co-write a track for his acoustic album (ACODELIA) – and CU NEXT TUESDAY was the result… (Buy it on iTunes!! – just search for ACODELIA by Takashi O’Hashi). More recently, Jonathan Miller and I worked with Takashi over the internet on a radical re-working of a track the old Neither Reality Nor Fiction album: Body and Soul. He added some of his awesome guitar to our pared down, slowed down trip-hop version – and a few months ago he asked if he could include it on his latest album. 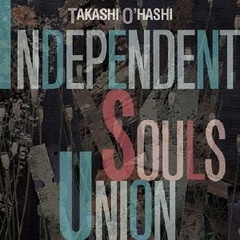 INDEPENDENT SOULS UNION is Takashi’s collaboration with lots of famous Japanese vocalist/lyricists and your truly. BUY IT – or at least buy BODY AND SOUL on itunes! But you can listen to my track here! PLAY IT LOUD! And then you might wanna check out Takashi in a previous incarnation – SHOTGUN SALLY by CATS IN BOOTS!